This long-established estate in the northern district of Controguerra is today run by Stefano Illuminati. It produces more than one million bottles, of which the best known is the Riparosso Montepulciano, given moderate ageing in large casks and designed to be drunk fairly young. From old vines, and only produced in top years, is Zanna, a Colline Teramane DOCG aged for two years in casks. It’s creamy, concentrated and spicy, and inevitably tannic too. More unusual is Daniele, a gently oxidative blend of Trebbiano, Passerina and Chardonnay, also aged in casks and only made in top years; it’s marked by apricot and quince flavours. Overall, well made, ambitious wines of high consistency. A visit to the Mosel so impressed young Cristiana Tiberio that she resolved to create an estate focusing on mountain vineyards with the intention of making wines – especially whites – of pronounced minerality. She founded the estate in 2004 and is now at the top of her game, producing outstanding Trebbiano and Pecorino, as well as fragrant yet lightly tannic Cerasuolo and silky Montepulciano. Her top wine is usually the citric Trebbiano Fonte Canale, made from old vines and fermented with indigenous yeasts. Look out too for her herbal, saline Pecorino, with its long, bracing finish. Fausto Albanesi tends and vinifies the vines near Loreto Apruntino that were inherited by his wife Adriana, although he has also purchased additional vines that bring the estate to its present 18ha. The barrel-fermented Pecorino and Trebbiano, both called Bianchi Grilli, are very good, but the star turns are his top Montepulcianos. These are Cocciapazza and Mazzamurello, parcel selections that are aged in barriques, with Mazzamurello spending 20 months in new oak. These are rich, spicy wines, with good depth of flavour and fine ageing potential. But even his basic Montepulciano is both charming and delicious. If only the names were less of a mouthful, the wines would surely enjoy greater international renown. Tucked away in the inland village of Ofena in the L’Aquila region is the 27ha estate of Luigi Cataldi Madonna, who also teaches philosophy at the local university. The vineyards lie at high elevations and give wines that are quite high in acidity. A pioneer of Pecorino, in his hands it is a splendid if very assertive wine. The cranberry-scented Cerasuolo is always outstanding, and so are his red wines. Malandrino is fresh, sleek and elegant, while Toni is a parcel selection, aged mostly in new barriques. All these wines are characterised by a noticeable polish and balance. 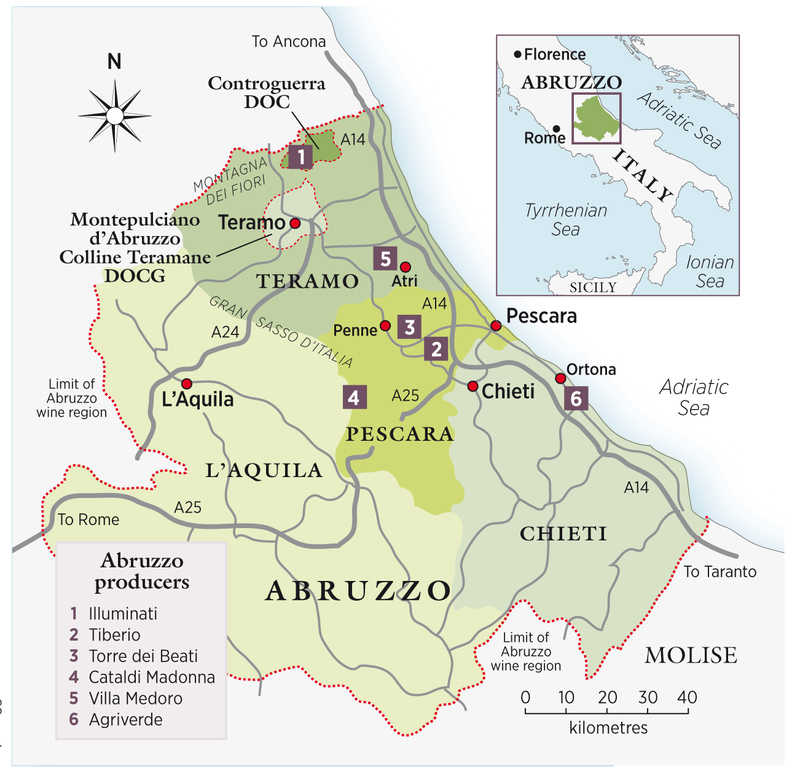 Founded in 1989 in Ortona, this is one of the few organic properties in Abruzzo. The winery too is constructed entirely of natural materials. With 65ha under vine, it produces a wide range. The Solèrea Trebbiano, aged in puncheons, is concentrated and spicy, but the Montepulciano reds are the stars. Winemaker Riccardo Brighigna is very proud of Plateo, though I find it rather too oaky and extracted, with hints of overripeness. I prefer the more vibrant Riseis, which is aged in older barriques. Even the basic, unoaked Piane di Maggio is spicy and lively, with lean cherry fruit. Former lawyer Federica Morricone was encouraged by Gianni Masciarelli to produce her own wines, basing her estate on vines inherited from her grandfather. Her first vintage was 2000 and since then she has a built a large, modern winery and has expanded the vineyards to over 100ha. She makes mineral, refreshing white wines from Montonico, Passerina and Trebbiano, but her finest white is Chimera, a parcel selection of Trebbiano. The Montepulcianos are modern in style, plummy and oaky in aroma and flavour. Her top reds are Rosso del Duca and the slightly less oaky Adrano, a barrique-aged Colline Teramane.